Combined with an acidic ionic liquid, this catalyst can make hydrogen gas fast and efficiently. RICHLAND, Wash. — The design of a nature-inspired material that can make energy-storing hydrogen gas has gone holistic. Usually, tweaking the design of this particular catalyst — a work in progress for cheaper, better fuel cells — results in either faster or more energy efficient production but not both. Now, researchers have found a condition that creates hydrogen faster without a loss in efficiency. And, holistically, it requires the entire system — the hydrogen-producing catalyst and the liquid environment in which it works — to overcome the speed-efficiency tradeoff. The results, published online June 8 in the Proceedings of the National Academy of Sciences, provide insights into making better materials for energy production. "Our work shows that the liquid medium can improve the catalyst's performance," said chemist John Roberts of the Center for Molecular Electrocatalysis at the Department of Energy's Pacific Northwest National Laboratory. "It's an important step in the transformation of laboratory results into useable technology." The results also provide molecular details into how the catalytic material converts electrical energy into the chemical bonds between hydrogen atoms. This information will help the researchers build better catalysts, ones that are both fast and efficient, and made with the common metal nickel instead of expensive platinum. The work explores a type of dissolvable nickel-based catalyst, which is a material that eggs on chemical reactions. Catalysts that dissolve are easier to study than fixed catalysts, but fixed catalysts are needed for most real-world applications, such as a car's pollution-busting catalytic converter. Studying the catalyst comes first, affixing to a surface comes later. In their search for a better catalyst to produce hydrogen to feed into fuel cells, the team of PNNL chemists modeled this dissolvable catalyst after a protein called a hydrogenase. Such a protein helps tie two hydrogen atoms together with electrons, storing energy in their chemical bond in the process. They modeled the catalytic center after the protein's important parts and built a chemical scaffold around it. In previous versions, the catalyst was either efficient but slow, making about a thousand hydrogen molecules per second; or inefficient yet fast — clocking in at 100,000 molecules per second. (Efficiency is based on how much electricity the catalyst requires.) The previous work didn't get around this pesky relation between speed and efficiency in the catalysts — it seemed they could have one but not the other. 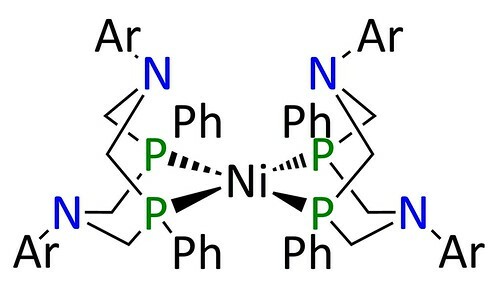 Hoping to uncouple the two, Roberts and colleagues put the slow catalyst in a medium called an acidic ionic liquid. Ionic liquids are liquid salts and contain molecules or atoms with negative or positive charges mixed together. They are sometimes used in batteries to allow for electrical current between the positive and negative electrodes. The researchers mixed the catalyst, the ionic liquid, and a drop of water. The catalyst, with the help of the ionic liquid and an electrical current, produced hydrogen molecules, stuffing some of the electrons coming in from the current into the hydrogen's chemical bonds, as expected. As they continued to add more water, they expected the catalyst to speed up briefly then slow down, as the slow catalyst in their previous solvent did. But that's not what they saw. "The catalyst lights up like a rocket when you start adding water," said Roberts. The rate continued to increase as they added more and more water. With the largest amount of water they tested, the catalyst produced up to 53,000 hydrogen molecules per second, almost as fast as their fast and inefficient version. Importantly, the speedy catalyst stayed just as efficient when it was cranking out hydrogen as when it produced the gas more slowly. Being able to separate the speed from the efficiency means the team might be able to improve both aspects of the catalyst. The team also wanted to understand how the catalyst worked in its liquid salt environment. The speed of hydrogen production suggested that the catalyst moved electrons around fast. But something also had to be moving protons around fast, because protons are the positively charged hydrogen ions that electrons follow around. Just like on an assembly line, protons move through the catalyst or a protein such as hydrogenase, pick up electrons, form bonds between pairs to make hydrogen, then fall off the catalyst. Additional tests hinted how this catalyst-ionic liquid set-up works. 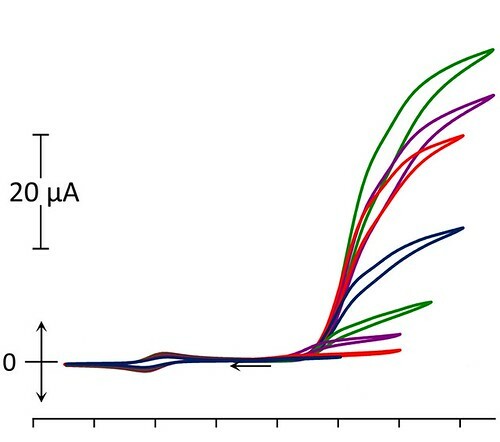 Roberts suspects the water and the ionic liquid collaborated to mimic parts of the natural hydrogenase protein that shuffled protons through. In these proteins, the chemical scaffold holding the catalytic center also contributes to fast proton movement. The ionic liquid-water mixture may be doing the same thing. Next, the team will explore the hints they gathered about why the catalyst works so fast in this mixture. They will also need to attach it to a surface. Lastly, this catalyst produces hydrogen gas. To create a fuel technology that converts electrical energy to chemical bonds and back again, they also plan to examine ionic liquids that will help a catalyst take the hydrogen molecule apart. The Center for Molecular Electrocatalysis at PNNL is one of 46 Energy Frontier Research Centers supported by the U.S. Department of Energy Office of Science at national laboratories, universities, and other institutions across the country to accelerate basic research related to energy. DOE's Office of Science is the single largest supporter of basic research in the physical sciences in the United States, and is working to address some of the most pressing challenges of our time.